(CNN) -- An Indonesian fisherman has been killed by Komodo dragons after he was attacked while trespassing on a remote island in search of fruit, officials said Tuesday. Komodo dragons kill their prey with an extremely toxic bite. Muhamad Anwar, 32, bled to death on his way to hospital after being mauled by the reptiles at Loh Sriaya, in eastern Indonesia's Komodo National Park, the park's general manager Fransiskus Harum told CNN. "The fisherman was inside the park when he went looking for sugar-apples. The area was forbidden for people to enter as there are a lot of wild dragons," Harum said. Other fisherman took Anwar to a clinic on nearby Flores Island, east of Bali, but he was declared dead on arrival, he added. Komodo dragons, the world's heaviest lizards, can grow up to 3 meters (10 feet) in length and have a toxic bite that they use to kill prey such as buffalo, returning to feast when the animal succumbs to the poison. Despite their ungainly appearance, the carnivorous reptiles can run as fast as a dog in short bursts, jump up on their hind legs, and kill animals with a blow of their powerful tails. Attacks on humans are rare, but Monday's incident is the latest in a series in which the monster lizards -- which have forked tongues and fearsome claws --have killed or injured people. Last month a park ranger survived after a Komodo dragon climbed the ladder into his hut and savaged his hand and foot. In 2007 an eight-year-old boy died after being mauled. In June last year, a group of divers who were stranded on an island in the national park -- the dragons' only natural habitat -- had to fend off several attacks from the reptiles before they were rescued. Park rangers also tell the cautionary tale of a Swiss tourist who vanished leaving nothing but a pair of spectacles and a camera after an encounter with the dragons several years ago. 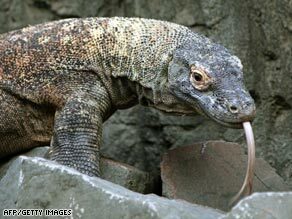 An endangered species, Komodo are believed to number less than 4,000 in the wild. Access to their habitat is restricted, but tourists can get permits to see them in the wild within the National Park. All visitors are accompanied by rangers, about 70 of whom are deployed across the park's 60,000 hectares of vegetation and 120,000 hectares of ocean. Despite a threat of poachers, Komodo dragon numbers are believed to have stabilized in recent years, bolstered by successful breeding campaigns in captivity. On Monday, a zoo in Surabaya on the Indonesian island of Java reported the arrival of 32 newborn Komodos after the babies all hatched in the past two weeks, the Jakarta Post reported.